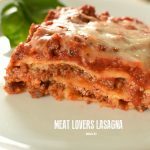 Meat Lovers Lasagna loaded with lean ground beef, Italian sausage and four different kinds of cheese. Often I find myself ordering classic things like lasagna when eating out at Italian Restaurants. If they make a good lasagna, I know I’ll be back! 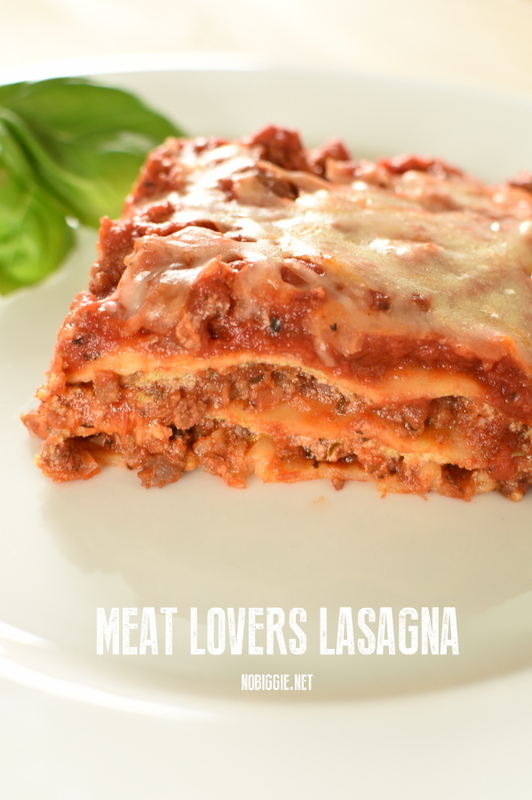 If you are not eating out, it’s so fun to make lasagna at home and have it turn out amazing! There’s a few tips and tricks to get it to turn out awesome! -No Boil Noodles: yep! Go for the Blue Barilla Box. These noodles will give you more of a restaurant style lasagna. -Add one whisked egg to the ricotta layer. This will give the ricotta layer an added richness. -Use a heavy duty metal pan. 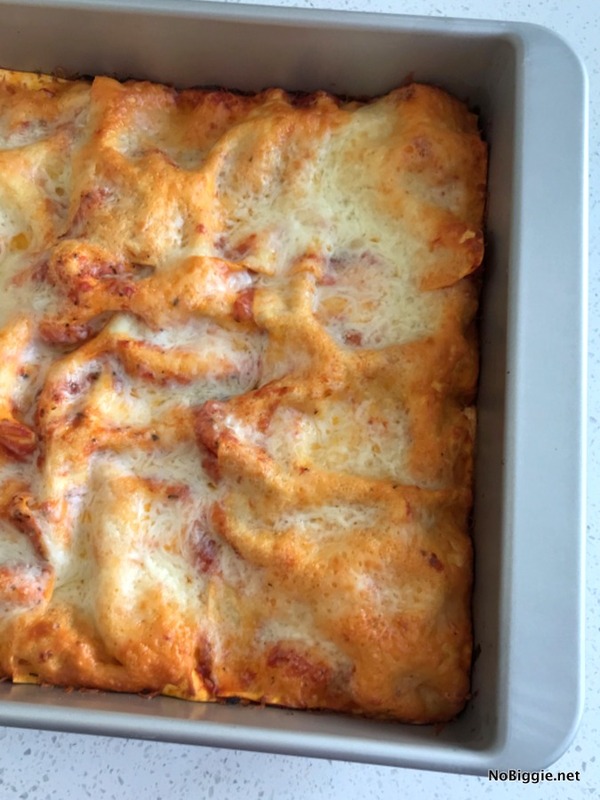 A glass pan is not great for the weight (and height) of this lasagna. 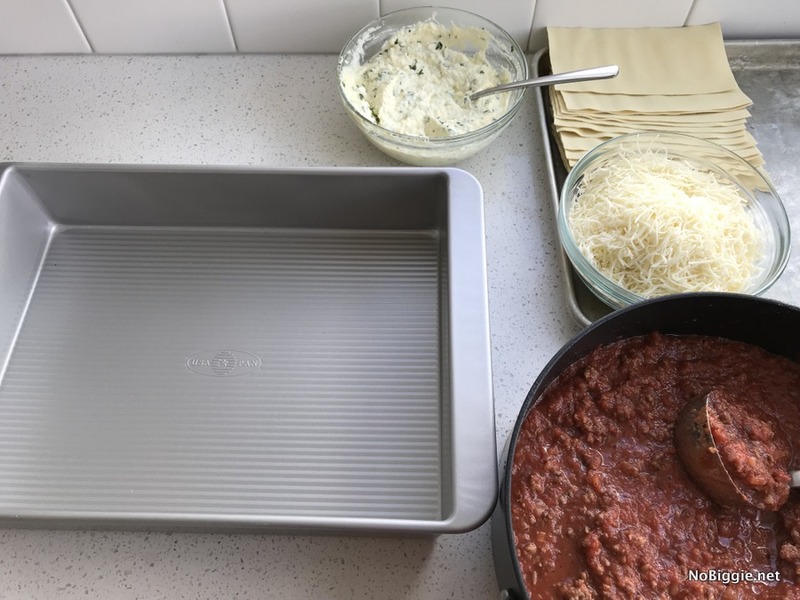 Here is a good metal baking pan we love. -Two kinds of meat: lean ground beef and Italian Sausage. -Let the lasagna cool in the pan for at least 30 minutes before cutting into it to serve it. 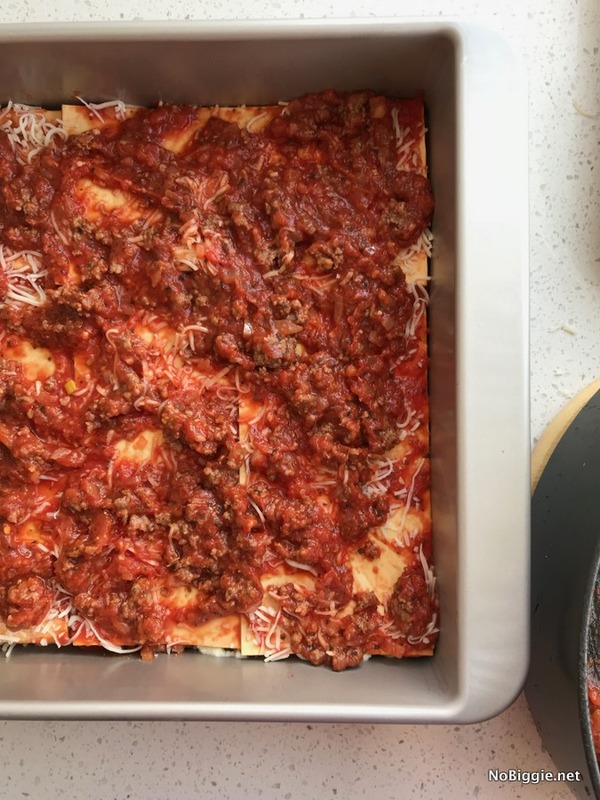 You can freeze an entire lasagna, before baking. Just make sure that all the layers are cooled room temperature before freezing. You can also freeze individual portions of lasagna after baking for an easy meal to warm up for one. 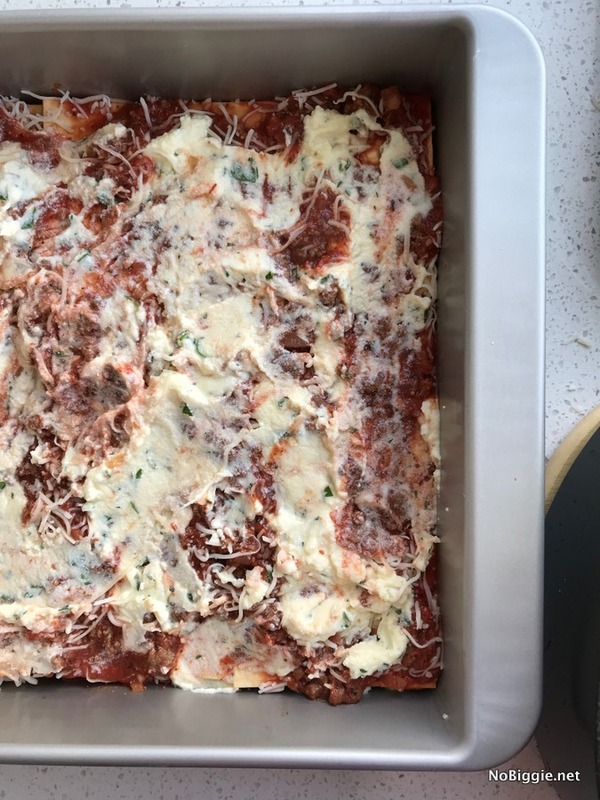 Just make sure to allow the lasagna to completely cool in the pan (up to one hour) after baking to cut it into nice even pieces. 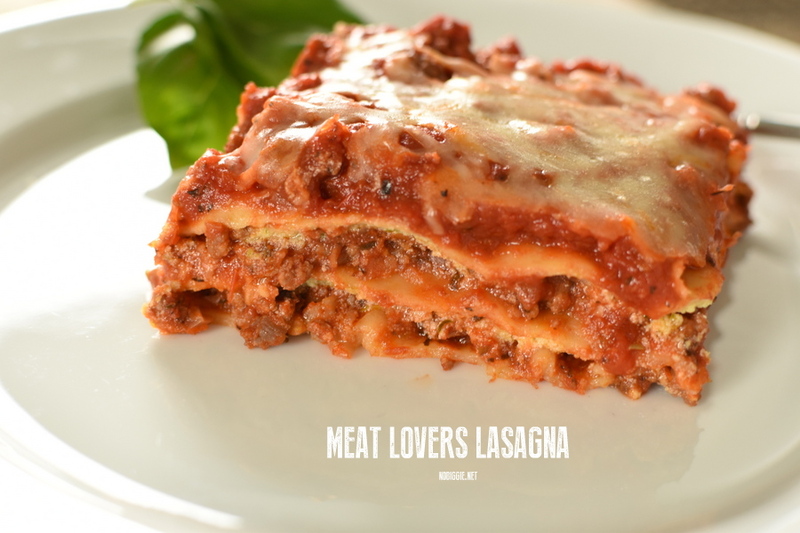 Meat Lovers Lasagna is loaded with ground beef, Italian sausage and four different kinds of cheese. In a large skillet, brown the ground beef and the Italian sausage together breaking it up into small chunks. When the beef is browned add in the dried basil, dried oregano, 2 tsp. salt and crushed red pepper flakes. Tip the pan on an angle and absorb any excess liquid fat with a paper towel. Add in the marinara sauce. Stir to combine. In a glass bowl whisk the egg and then add in the ricotta cheese, chopped flat leaf Italian Parsley and the salt. Mix well to combine. Prepare to assemble the lasagna. Have all the layers ready to go near the pan: the sauce layer, no boil noodles, grated cheeses and the ricotta layer. In your heavy duty 9x13 metal pan add 1 1/2 cups of the meat marinara sauce to the bottom of the pan. Gently place each no boil noodle in the marinara sauce to coat in the sauce to make sure they won't get dry in the oven. Place the coated no boil noodles in an even layer to fill the pan: 4 across and one broken in half vertically to fill the pan. Add 1/3 the cheese, another 1 1/2 cups of the meat marinara sauce, 1/4 of the mozzarella, 1/4 of the parmesan and 1/3 of the ricotta in spoonfuls spread across the pan. Repeat with the layers with more noodles/cheese/marinara meat sauce, until you run out. 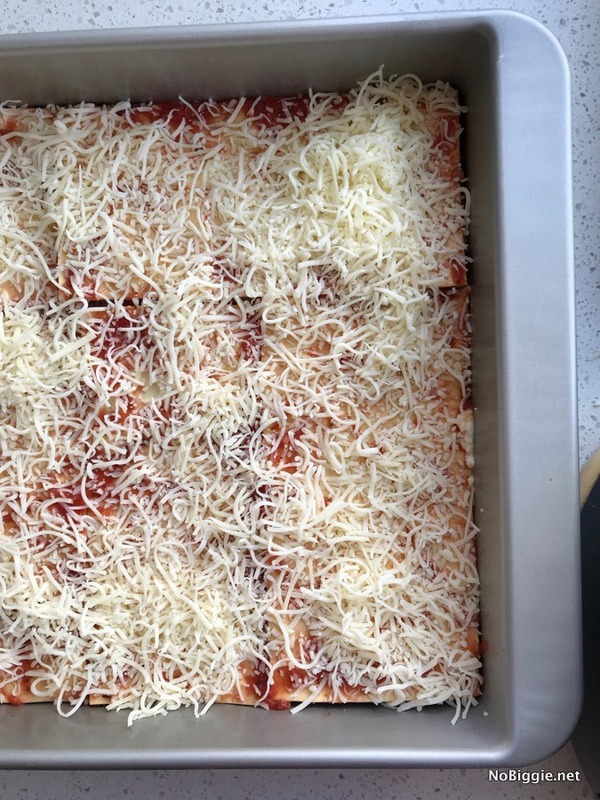 Bake for 50 minutes, then take the foil off and bake for another 10 minutes to brown the cheese on top. Allow the lasagna to cool in the pan for 30 minutes before cutting and serving. Garnish with more chopped flat leaf parsley. This recipe works best with a metal pan with high sides to hold the height and weight of all the layers. 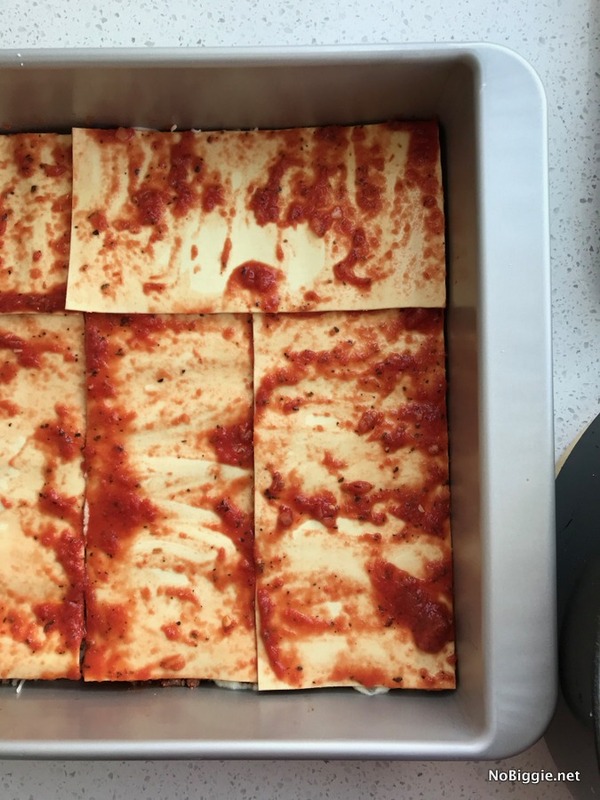 This lasagna freezes well before baking or after baking you can freeze it in individual portions. That’s it! My family LOVES when I make lasagna! It makes the best leftovers the next day too!